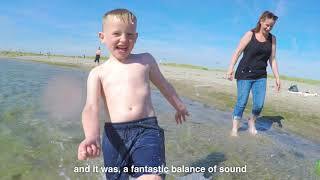 "This is the first time I've been extremely excited about hearing aid technology"
ReSound ENZO 3D is the smallest hearing aid available for people with severe-to-profound hearing loss. It comes in two behind-the-ear styles and a wide range of colors. Every component is coated with iSolate nanotech, an ultra-thin shield that seals it off from water, dust, and ear wax. It offers exceptional battery life and long durability - our 98 model battery, for example, lasts for 12 days when streaming up to four hours per day. The new ReSound Smart 3D app lets you control volume and adjust bass, middle and treble. You can choose location settings easily and discreetly, even saving a 'favourite' and geo-tagging a specific location to switch to that same setting next time you're there. While your first fitting will always take place in a clinic, you can now also contact your hearing care professional and get your hearing aids adjusted at a distance. This is our new ReSound Assist feature. ReSound Assist puts you in direct contact with your hearing care professional and makes it possible to ask questions and get advice at your convenience, as well as fine-tune your hearing aid wherever you are. Your new settings will be sent right to the ReSound Smart 3D app on your phone. ReSound ENZO 3D turns your hearing aids into wireless headphones, making it easy to talk on the phone. Even in a noisy environment, you’ll hear with remarkable clarity. Whether you’re watching your favorite video, listening to music, or talking on the phone, ReSound ENZO 3D lets you stream the sound directly to your hearing aids. ReSound ENZO 3D is the only Made for iPhone hearing aid for people with severe-to-profound hearing loss (Android users can stream with just one small additional device). That means that if you have an iPhone, iPad, or iPod touch, ReSound ENZO 3D requires no accessories to stream sound right to your hearing aid. Use FaceTime video calls with ReSound ENZO 3D and experience 70% improvement in speech compared to audio only phoning. Streaming sound from a range of ReSound wireless accessories lets you get even more out of your hearing experience. You can hear speech more clearly in noisy environments and at a distance, as well as watch TV at your own volume, while people around you enjoy it at their volume. Find a local hearing care professional who can introduce you to the new ReSound ENZO 3D.